This is created for cast in mind who want to up skill themselves before their next horse riding role. Private lessons are however open to anyone. Our lessons are available Monday – Friday (dependant on filming schedules) unless by prior negotiation. These cover general horsemanship and riding skills as well a particular focus on riding horses for film. The cost is $75 on an Equine Films horse or $60 on your own horse. This is for approx 1 hour. 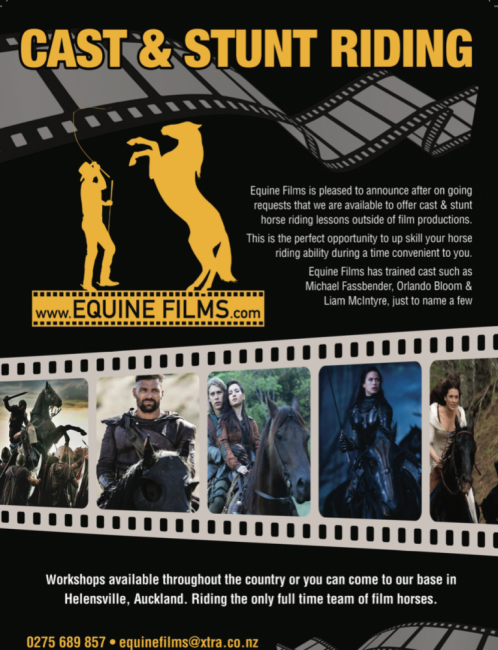 Do you own a horse you would like to put forward for film work? Would you like to apply for a horse stunt workshop? This initial horse and/or rider assessment is the first step to getting onto our books for future film productions. Our assessment are available Monday – Friday (dependant on filming schedules) unless by prior negotiation. The price to assess your horse is $50 or to be assessed as a rider on an Equine Films horse $60. This workshop is created for people who have an interest in the film industry and have a love for horses. The wranglers workshop will be completed over one and a half days and attendees will be given an insight of our training methods, what is expected on a film set prioritizing safety and welfare. Price is $280 with your own horse and $380 on an Equine Films horse. Price includes BBQ dinner first evening. Limited spaces available. This is for those people who have completed an initial riding/horse assessment who would like to be combine stunts and horses. This workshop is in association with Steve McQuillan from Action House Stunts. Steve is a very well credited and experienced Stunt Coordinator in the NZ and wider film industry. This workshop takes place over a weekend and covers riding horses for film, horse stunts including handling a weapon, saddle falls – to name a few! Price on application and includes a BBQ dinner on the first night.